GRLevel3 2.00 Midland NWS Dual Pol Doppler Radar Snapshot. 7:27 PM MDT. June 8, 2014. Storm Relative Velocity (SRV) Image. 6:40 PM MDT, June 8, 2014. 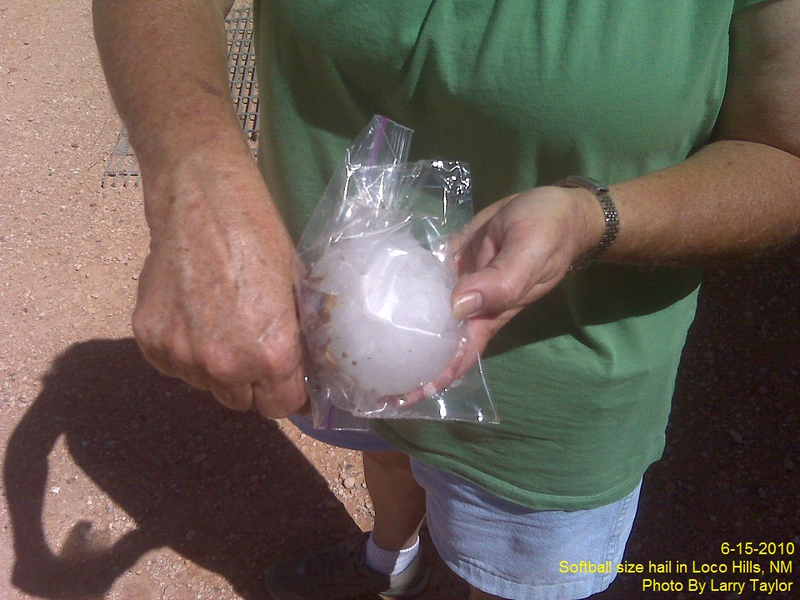 Grapefruit Size Hail In Dayton, 10 Miles South Of Artesia, NM. 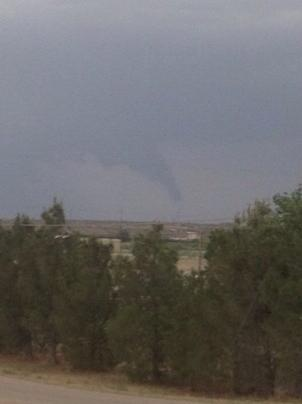 Funnel Cloud Northeast Of Otis Or 5 Miles NNW Of Loving, NM. This Funnel Cloud Briefly Touches Down & Becomes A Tornado At 7:06 PM MDT, June 8, 2014. 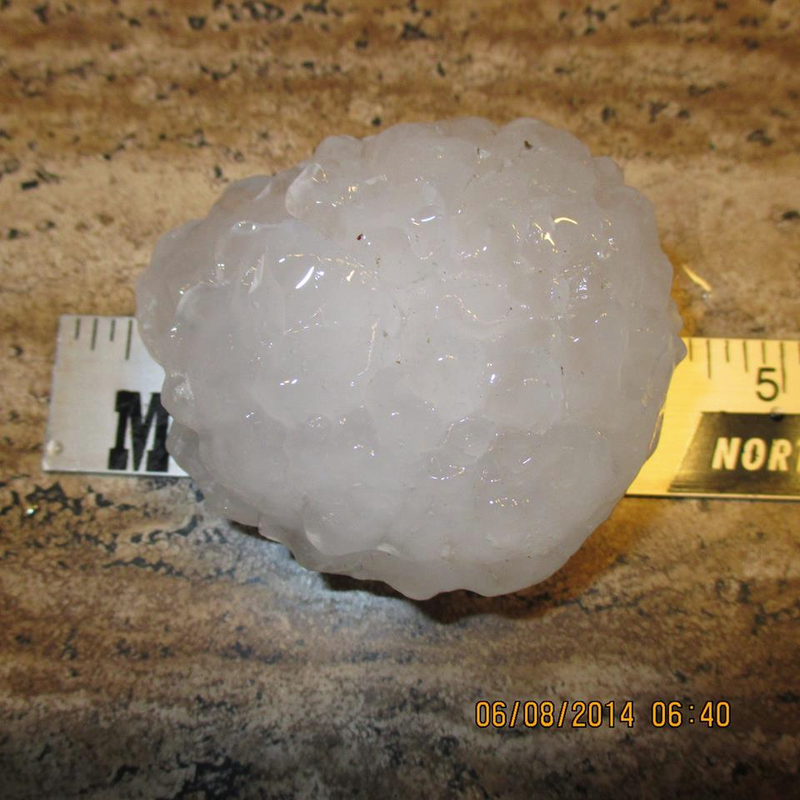 For additional information and photos of the destructive hail that struck Eddy County Sunday, June 8th of last year please click on this link. Numerous reports of hail the size of Limes (2'' in dia) to Grapefruits (4" in dia) were noted in Chaves and Eddy Counties last June 8th. To the best of my knowledge this outbreak last year was the one of the worst and most widespread hailstorms in years. A relatively rare mountain tornado rated as an EF1 touched down in Encinoso in Lincoln County, north of Capitan at 6:00 PM MDT. This tornado was 160 yards wide and stayed on the ground for 13/4 miles. Quote: Supercell thunderstorm near Encinoso spawned a tornado along Highway 246 at Richardson Canyon Road. The tornado traveled east-southeast down Richardson Canyon Road, snapping off the tops of trees and breaking numerous branches of Ponderosa pine. The tornado intensified as it approached 2 homes. A single wide mobile home from the 1970s was completely destroyed as the undercarriage was moved about 20 feet and all walls separated and tossed. A double wide mobile home was tossed into a barn and destroyed. Portions of the roof were blown 250 yards away. At least two other homes as well as a barn and shed sustained damage. New Mexico Severe Weather Awareness Week. (March 29th - April 4th). Additional Severe Weather Info From NWS Albuquerque. Severe Weather In SE NM. Tornado South Of The Roswell, NM Airport. Softball Size Hail In Loco Hills June 15, 2010. Southeastern New Mexico is no stranger to severe weather. Typically our sever weather season runs from roughly April through June with a second season in September and October. However severe thunderstorms can and have occurred in just about every month of the year. Believe it or not but a tornado was noted 4 miles west of Hagerman in Chaves County on December 2, 1997. This is only the second tornado that has ever been reported in December in New Mexico. Since 1951 there have been 34 days in which tornadoes have been reported in Chaves County. Hail the size of pennies or larger has fallen on 129 days since 1959. Since 1959 there have been 45 days in which tornadoes have been reported in Eddy County. Hail the size of pennies or larger has fallen on 200 days since May of 1961. Since 1954 there have been 66 days in which tornadoes have been reported in Lea County. Hail the size of pennies or larger has fallen on 210 days since 1957. With the advent of Doppler radar in the early 1990's, and an ever growing Skywarn Storm Spotter base in New Mexico, we are finding out that severe weather is more common that was once thought. This is especially true across the eastern one third of the state...east of the mountains. No doubt that have been many destructive hail events and perhaps tornadoes that have gone unreported prior to the 1970's. For additional information on past New Mexico Tornadoes click on this link: Tornado Project Online - Tornadoes In NM. Limited list of some of my past blogs concerning severe weather in southeastern New Mexico. Click on the links to open them up. Roswell Tornado - October 21, 2010. Roswell, NM Funnel Cloud - October 21, 2010. Tornadoes Touch Down NW Of Roswell - October 21, 2010. My Thoughts - March 18, 2011. Could It Happen Here - May 26, 2011. Tornado Videos In SE NM - April 3, 2012. Limited Tornado History In SE NM - April 6, 2012. Supercell Thunderstorms In SE NM - May 3, 2012. Dexter NM Wall Cloud & CBMAM - May 7, 2012. Midway/Dexter/Bottomless Lakes State Park Tornadoes - May 7, 2012. My Storm Recap & Thoughts On Monday's Severe Weather May 10, 2012. 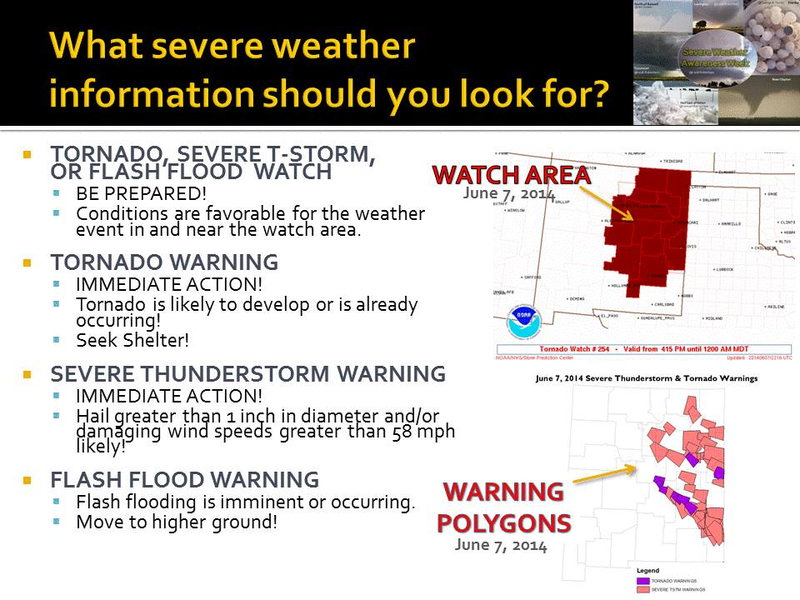 Staying Safe During Severe Weather - May 20, 2014. Roswell, NM Supercell Thunderstorm & Time Lapse - June 8, 2014. New Mexico's 10 Top Deadliest/ Injurious Tornadoes Since 1950. This F2 tornado was on the ground for 36 minutes across Roosevelt and Curry counties. In Roosevelt County, estimated peak winds of near 120 mph severely damaged the Portales City water well facility on State Road 202 about 5 miles east of Highway 70. The tornado moved north northwest destroying a new dairy before continuing northwest into Curry County. No injuries were reported at the dairy but storm debris briefly trapped an employee. About 190 dairy cows were either killed by the event or else sent to immediate slaughter due to injuries. The tornado continued into Curry County into southern and east central sections of Clovis. The intensity of the tornado appeared to wane from EF2 (120 mph) in Roosevelt County to EF1 (100 mph) as it moved north into Curry County along Highway 70 where damage was limited to power lines and farm irrigation equipment. Intensity increased again to EF2 level (125 mph) for a segment extending from about 4 miles south of Clovis northward into southeast Clovis which sustained the heaviest and most consistent damage as indicated by structural damage and downed power poles. The tornado appeared to wane again as it move north over Highway 60/84 just east of the intersection with Highway 70. The tornado track became intermittent north of Highway 60/84 with winds likely less than 85 mph before a final one half mile track of heavier damage and EF2 level winds of 120-125 mph. Average width was estimated at 200 yards. About 500 homes and other facilities sustained at least some damage ranging from complete destruction of mobile homes in southeast Clovis and wall collapse at several businesses along Highway 60/84 to the loss of roof shingles and roof top air conditioning units. Thirty five people suffered treatment injuries including five that required hospitalization. Two elderly citizens died later from injuries sustained during the event making these the first tornado fatalities in New Mexico since October of 1974. After damaging two farms about two miles west of town, the tornado followed a three mile, four block wide path toward the northeast through the center of town. In all, 18 homes were destroyed, and 38 more were damaged, 18 of these had major damage. One person died in a demolished building. Five of the eight injured had to be hospitalized. A number of farm buildings were also destroyed or damaged, and farm animals were killed. The water supply line was also severed. Damage totaled $450,000. Preceded by golf ball size hail, this tornado ripped through the village of Canoncito (now Tohajiilee) killing a 2 week old baby girl and injuring 8 others. Three trailer homes were destroyed and up to 10 other houses damaged. Witnesses say the "small tornado" swooped through the camping area, downing about 300 tents located on a flat near Ranch Headquarters. Camping Equipment was found as far as 14 miles away from the campsite. In addition, the nearly completed cinder block chapel was leveled. The injured included 33 boy scouts and a scout leader. A tornado touched down three miles southeast of the Carlsbad Airport, tracking northeast. Fourteen mobile homes were destroyed and 37 additional buildings were damaged. Numerous cars, trucks, campers and boats were damaged or destroyed. People felt fortunate that the tornado occurred when most were still outside and not in their homes or sleeping. One family reported their couch missing and was later found 1 to 2 miles away. Another reported an automobile had been lifted into the air. A small and possibly elevated landspout type tornado developed on the far east end of a rear flank outflow that swung south through east over Logan as a storm centered about 5 miles to the west moved north over Ute Lake. Damage along the track as it moved over the west side of Logan was intermittent with damage indicators pointing to winds of general 80 to 90 mph with peak winds near the south and north ends of the track estimated at 105 mph. Average track width was around 100 yards. About a dozen injuries were reported with only two transported to Tucumcari for brief treatment in hospital. Heaviest damage was mainly confined to about 50 manufactured homes and recreational vehicles tossed and rolled mainly on the south end of the lake resort community. Damage to site constructed homes and buildings was limited to window, roof and soffit damage except for one 1910 era frame home that lost its roof. The tornado caused part of a restaurant's roof to collapse, slightly injuring six people, as it hit west-central sections of Carlsbad. It also ripped roofs off a furniture store, a department store and part of an apartment complex. Major damage occurred at an industrial area; a large cinderblock wall was pulled away from a manufacturing building, and a large warehouse was demolished. 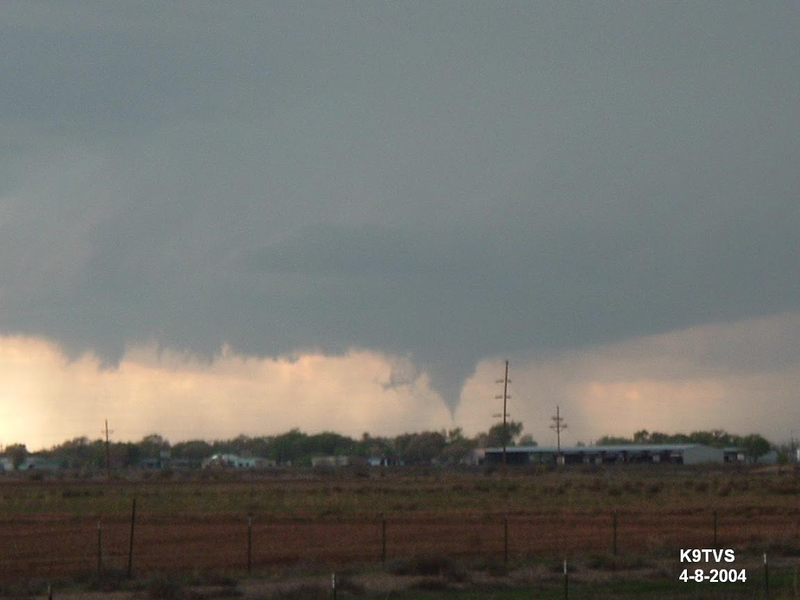 This tornado was moving parallel with another tornado that formed 5 miles southwest of Hobbs. Additionally, another tornado was moving through the city at the same time. In all 80 locations reported damage; 3 homes were destroyed, 7 homes had minor damage, 7 mobile homes had minor damage, 1 apartment complex had minor roof damage, 20 to 30-foot tall trees were uprooted in cemetaries, 7 homes had flood waters in them, 2 houses had lightning damage, and 92 trees were destroyed. A 40 year old woman was admitted to Lea County Regional Hospital with a fractured ankle from this tornado. Four others were treated for minor cuts and bruises. In all, damage was estimated at $354,000. A tornado destroyed 11 homes and 7 business in Cimarron. Another 43 structures were damaged. Among the building destroyed was the Post Office which was sliced by the air-borne frame of a mobile home. Of the 5 injuries, 2 were serious, requiring hospitalization. All injuries occurred in mobile homes or portable buildings without permanent foundations. A funnel cloud was observed by deputies for about 20 minutes. The tornado developed as convection moved over a horizontal shear axis created by southeast surface winds and northwest winds aloft above the foothills located just northwest of Cimarron. A couple was injured as the tornado picked up their camper and dumped it, and a third person in the open. 19 boats sunk and another 16 were damaged. Other damage occurred to the marina. Total damage was estimated at $100,000. Tornado at the north edge of Walker Air Force base overturned a 55 by 10 foot trailer house and moved it 37 feet, injuring 3 of the 7 occupants. Prior to 1950, records, though likely incomplete, suggest there were 5 additional tornado related fatalities in New Mexico. Three of these fatalities occurred May 31, 1930 in Wagon Mound, one occurred June 5, 1931 in Sedan, and one occurred May 31, 1936 in Socorro. Some records also suggest there was a fatality with the May 10, 1957 Farmington tornado. While a fatality did occur with this storm, research indicate that it was not associated with the tornado.